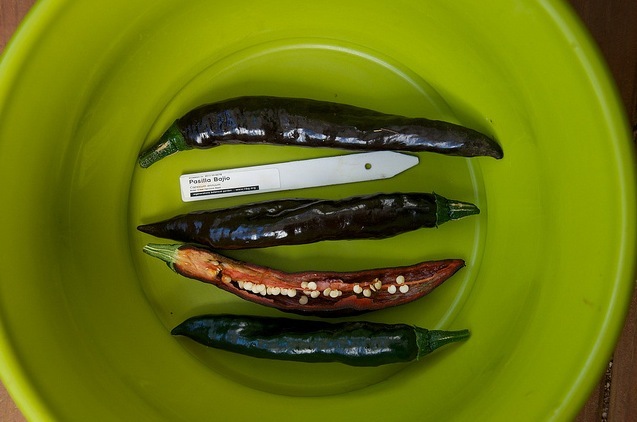 Pasilla Bajio Peppers: Trying new varieties for your locale is fun and rewarding–especially when the experiment produces viable seed that can be shared and saved. This Mexican variety performed excellently in Kaua`i Community Seed Bank's 2011 pepper "try-um"
From the past several weeks of focus on seeds, one lesson is clear: in order to combat the rapid control and very concerning prominence of corporate agriculture businesses we must find ways to interact with seeds at the local level. Our interviewees have urged us to make it personal, to connect with seeds, and to consider them as being an integral part of what will make the movement of local agriculture thrive. Due to the fact that Genetically Modified seeds are designed not to reproduce, the action of saving local seeds is an essential part of the solution. To this end we wanted to provide you with an introductory resource on how to start saving your own seeds and begin investing in seed banks in your local region. 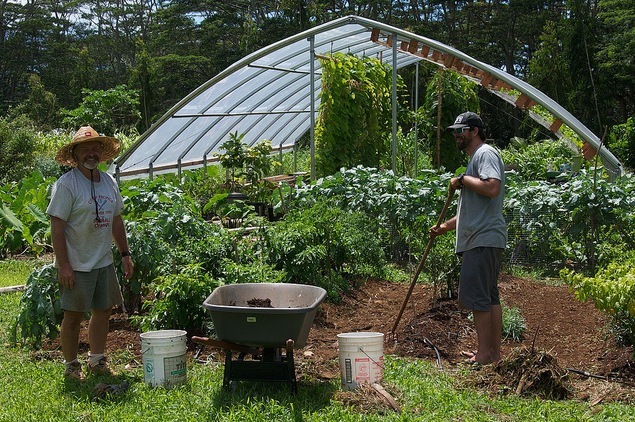 In thinking about who could help us get informed about starting a seed bank we were lucky enough to meet Paul Massey, who is the Director of the Regenerations Botanical Garden in Hawaii. Paul’s five-year-old organization stemmed from a love of his area and a sense of urgency: “falling in love with native flora that is highly endemic led to a realization that a lot of our natural places are highly degraded and are under high pressure from invasive species. 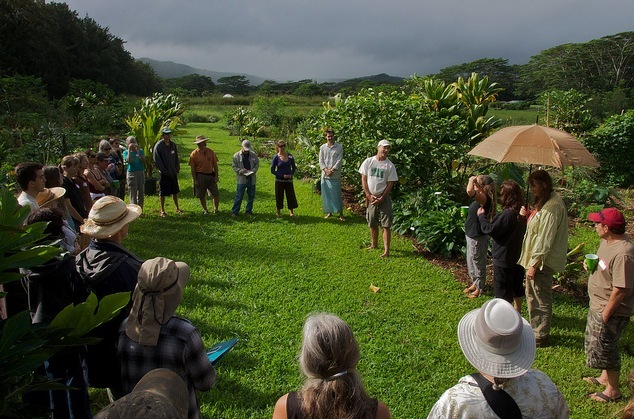 It’s a time where we have to capture as much bio diversity as we can before it’s lost.” Since its inception Regenerations had a great deal of success and is continuing to grow it’s impressive seed libraries, seed gardens and engaging the communities with these issues. You can read about their programs here. Below you’ll find Paul’s How-To Guide. When sharing this he only cautioned one thing – to remember that the process of developing relationships with seeds is not linear! Each local region has its own specific characteristics and he reminds us that there is no one way to approach this knowledge seeking. But rather, many areas of knowledge and experimentation must be sought on simultaneous tracks. From the very personal use of seeds, to the development of a business in a seed bank, what Paul shares with us are reminders, guideposts, and places to jump from. For those of us that are novice seed savers his How-To is an excellent place to start and I’ve found nothing quite like it in all my online research. What seed is being produced in your area? If done commercially, it is probably well suited to the current environmental conditions. Especially important are landraces – crops that are highly adapted to specific areas and local low-input farming systems. For example botanical gardens; agricultural extension services; state, federal, and university agriculture departments; invasive species councils, etc. These are primary sources of regulatory, scientific, and technical information related to seed production and environmental management. 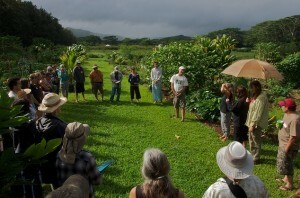 A great way to meet growers, see local crops, assess seed saving skills of your community. Everything you need is online. Research what sources are relevant for your area and start to make connections there. 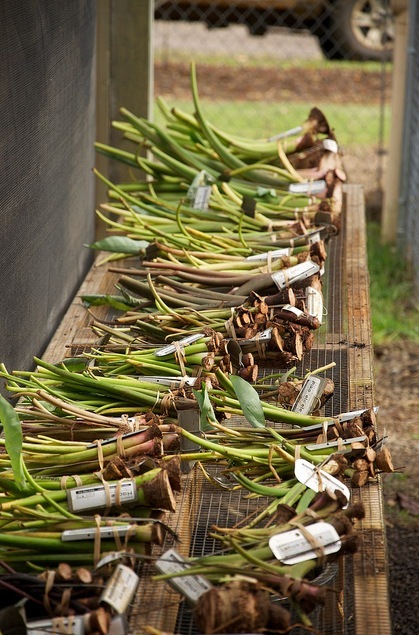 We are primarily focusing on locally adapted food crops, with a secondary focus on native & medicinal. If you are in an urban area you might want to look into who is using aquaponics, rooftop gardens, vertical gardens and farms, and community gardens. The groups and individuals involved in these initiatives can help you define where you’d like to start, what your needs are how you’d like to contribute. 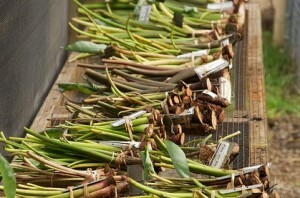 Even seed banks in developing countries with no electricity are successful. These initiatives don’t have be expensive and cause a financial drain. By finding your niche and interest you can then see what supplies you might need and source creatively. If you are building a seed bank make sure you back up your collection of seeds in two locations. Members will have the tendency to compare the prices of your seed with commercial growers. 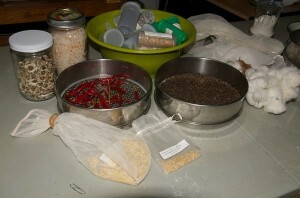 If you are building a seed bank consider creative methods of acquiring memberships and buy in. For example, when members set their own prices for their seed they are placing the value themselves, therefore, getting more for their money and contributing to the sustainability of the seed bank. For those of us that are excited and capable of growing our own food, saving seeds and contributing to local seed libraries is an ideal way to start. It empowers us, challenges us, and connects us, in a personal way, to our rapidly shifting food systems at both the local and international levels. As Miguel Santistevan reminded us, one of the most profound ways we can take action is to vote with our dollars and buy foods from local producers. By becoming local producers ourselves, even on the smallest of scales, we are making an impact on our food systems and our relationships to these systems. As our contributors are doing their work, I will begin growing seeds in my tiny apartment in the hopes of making even a small batch of medicinal teas this summer and contributing some seeds back to the Pharmaseed in Montreal. While I do that, at Kindle Project, we’ll be continuing to keep abreast of the daily news that is surfacing about the fight against Monsanto, the action of farmers, and the developments of the Doomsday Bank. We will also continue learning from our partners who are saving seeds and working on these issues every day. Thank you to all our contributors this season and check back with us on April 5th when we’ll be starting a new theme!